This National Geographic article on science denial brought up some points I consider on occasion. It’s strange how some aspects of science have become so political, with global warming and evolution especially being viewed as left-wing concerns. Oddly, the anti-vaccination movement seems to attract both the far right and the far left, for different reasons. And it’s more of a leftist idea to oppose genetically modified food, although the issue is complicated somewhat by the fact that a lot of the genetic research is under the control of big businesses like Monsanto. The same concern plays a role in medical skepticism as well, because the science shows that medicine can save lives, yet it also puts money in the pockets of Big Pharma. When it comes to global warming, the science is largely against the corporate world, while on these other subjects it’s not so clear cut. I think the article was on to something when it mentioned the “two antagonistic tribes.” Yes, politics and religion play a role, but the larger concern is that of tribalism, of going along with the group with which you most identify. This can also help to explain how people can identify as Bible-believing Christians when the ideals they hold have nothing to do with Jesus or the Bible. Mind you, some of the terms that Joel Achenbach takes from Dan Kahar are rather problematic in and of themselves. How can someone be both individualistic AND hierarchical? And doesn’t being an individualist pretty much mean you WOULDN’T want to go along with your tribe? I guess it depends on how you’re using the term “individualistic,” because Kahar appears to use it as indicating that you look out for number one, not that you necessarily value independent thought. But then, independent thought is a tricky thing anyway, because we all have to trust somebody when it comes to concepts for which we have no frame of reference. I’m not really that knowledgeable about science; my educational background is more in liberal arts. So yes, I have to have a certain amount of trust in others when I accept the gradual process of evolution or the age of the planet, and even that the Earth revolves around the Sun. People who deny basic tenets of science and other common knowledge like to imagine that there’s some kind of conspiracy to hide the real truth. I’m not entirely sure what the goal of this conspiracy would be, but there have certainly been occasions when the commonly accepted model turned out to be wrong. The thing I don’t get is why you’d then believe people with obvious ulterior motives, like preachers, corporate spokespeople, and snake oil salesmen. There’s a pervasive attitude that scientists and academics are elitists, and in some cases the intellectuals aren’t doing much to dissuade this. Not that I know what they COULD do when people aren’t going to be swayed by facts and peer review. I also don’t understand when someone goes on about elitists and then votes billionaires who want tax cuts for their rich friends into office. But I guess some of these politicians are good at talking the talk of being on the side of the common person. Fundamentalist Christians loved that George W. Bush came across as one of them, regardless of what his actual policies were. I also have to say that, from my perspective, I’m not sure how science goes against common sense in some of the cases Achenbach mentions. Yes, I get that the Sun appears to be going around the Earth. But with evolution…well, what’s the alternative? There are certainly aspects of evolution that I don’t fully grasp, but at its most basic it comes down to mutation and changes in genetics, which we CAN observe. On the other hand, has anyone ever seen an organism generated out of nothing? For a long time, people believed that flies could automatically come into existence from rotting meat. I don’t think too many modern Creationists believe this, but at least it was based on observation. I guess the missing factor here is that Creationists already believe in an all-powerful God, while to me that’s also something that has to be verified by evidence. Vaccinations are another area in which I don’t think the basic principles are that difficult, but people refuse to learn them. When I was a kid, I learned that an inoculation put a little bit of a disease into your body so the white blood cells would find out how to fight it. I’m sure it’s a little more complicated than that, but that’s essentially how it works, right? On a recent episode of Real Time, Bill Maher (whom I generally like) was trying to compare vaccines to antibiotics, saying something about ruining the immune system. The difference is, at least as far as I understand it, that antibiotics cut out the white blood cells entirely, so taking too many of them can have a negative effect on immunity. With vaccines, isn’t it pretty much the opposite? 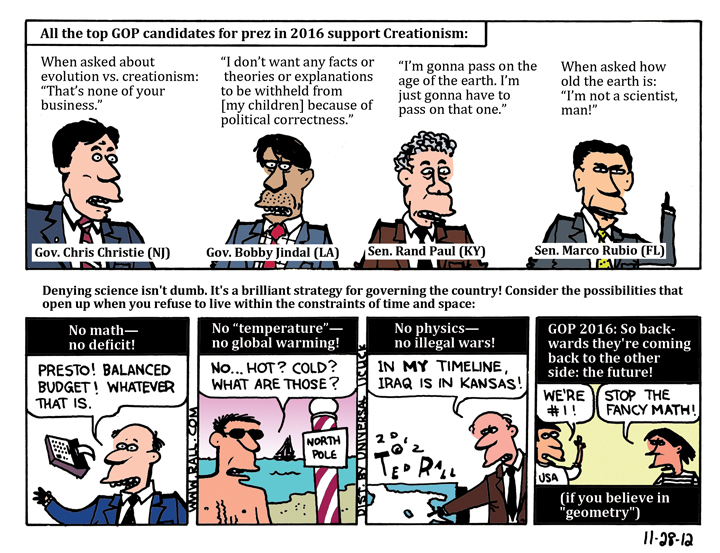 I do have to give props to the comments from another Bill on the same show, Bill Nye, who pointed out that the term “climate change skeptics” was misleading. I agree, because aren’t skeptics people who refuse to accept something until they know all the facts? Climate change deniers typically don’t care about the facts. This entry was posted in Capitalism, Christianity, Climate, Conspiracy Theories, Corporations, Drugs, Economics, Education, Environmentalism, Evolution, Food, Fundamentalism, Genetics, Global Warming, Health, Medicine, Politics, Real Time with Bill Maher, Religion, Science, Snobbery, Television and tagged big pharma, bill maher, bill nye, creationism, dan kahar, elitism, individualism, joel achenbach, monsanto, national geographic, president george w. bush, skepticism, tribalism, vaccination. Bookmark the permalink. I also object to the dogmatic insistence on the reality of macro-evolution, which has never passed the criteria of the scientific method and which falls by its staunchest adherents into the philosophical category of scientism (which itself is anti-scientific). Adherents of the hypothesis will point to countless examples of the minor changes evident in micro-evolution (which I consider real science, but also a misnomer and a bait-and-switch tactic), which cannot account for the gigantic changes that would be required for fish to turn into amphibians or reptiles, and for those to transmogrify into birds and mammals. Such a thing has never been observed, let alone studied; and it should be occurring all the time. We should see examples all the time of creatures in mid-transformation into something else; it should be told in our myths and legends. It’s not. The only place we find it is in the halls of science-writings and science-fiction. The more intact specimens we do discover from the distant past (such as those trapped in amber), the more it becomes clear that a fly or spider from a million years ago is in all respects (with minor variations) the same fly or spider we see now. The once-thought long extinct coelecanth from the late Cretaceous period is in all respects (with minor variations) the same coelecanth discovered alive and well in 1938. In all respects, macro-evolution is very much an ideological perspective, postulated by those who believe life began without supernatural origins, as is intelligent design an ideological perspective postulated by those who believe life began via supernatural origins. As far as evidence, I think it’s up to each individual to examine both positions for themselves without bias, as far as is possible. For my money, the latter is the most convincing even if I disagree in numerous other respects (e.g., the overwhelming evidence of climate change) with those who postulate it. Most of what I’ve heard about the mercury and stuff indicates that it’s only in trace amounts, and you’d need to be exposed to a whole lot of it for it to have ill effects. As for evolution, is there any actual scientific basis to the “macro” and “micro”? I can only recall seeing opponents of evolution use them. And aren’t ALL forms transitional ones? It’s not like evolution has a defined goal or endpoint. Now, there might be actual scientific objections to evolution, but the publicity always goes to people whose arguments are intended to defend viewpoints that aren’t at all supported by observational evidence, like the planet only being a few thousand years old. The thing is, evolution and Creationism are not opposite sides of the same coin; they’re entirely different concepts that encompass explanations for some of the same things. Disproving one doesn’t automatically prove the other. As to the scientific postulation that the small changes evident in micro-evolution, which really only speaks to variations and diversity WITHIN a species, somehow manifest in the far larger changes necessary to affect the sea change from one species to another, this remains unverifiable, unseen, untested and unproven. And you’re absolutely right that all we hear are arguments from the uninformed far-right who argue that the earth is only 6000 years old, and not from legitimate scientists, such as the signatories on http://www.dissentfromdarwin.org/, many of whom argue from science that the Darwinian hypothesis needs considerable examination before it can be considered foundational science, and yet critical discussion of it has been discouraged and treated with contempt. I agree as well that the two conceptions are not mutually exclusive propositions. Plenty of those who believe in a supernatural origin of life believe in evolution, while there are those who doubt or disbelieve in a supernatural origin of life who find the idea that evolution was the means by which life originated and spread on earth implausible and unscientific. One problem, as always, is that the discussion in the mainstream media is dominated by dogmatists. So long as men like Hamm and Dawkins dominate the discussion, all that will ever result is people withdrawing into their chosen echo chambers. The other is that both of the arguing sides are on slippery grounds. The Bible is not a science textbook and requires human interpretation, much of which can and has been in error (http://www.raptureready.com/rr-ec-debate.html). 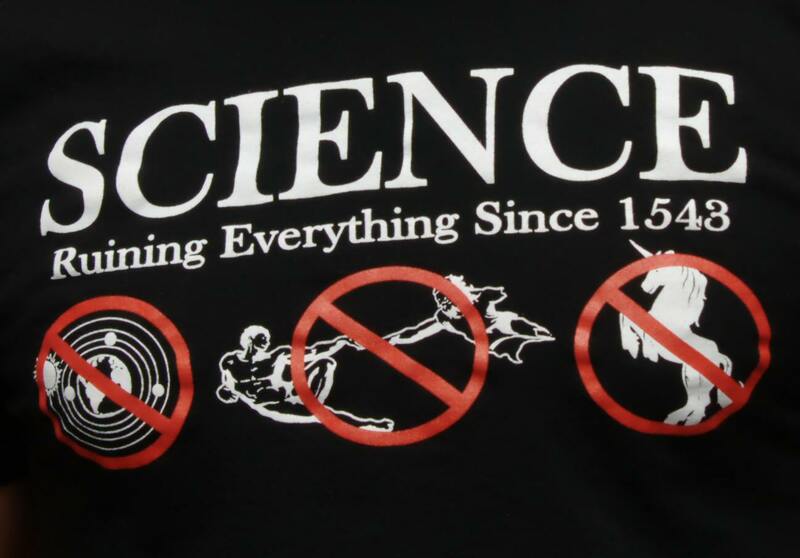 Science itself is not proof, but contingent knowledge based on observation and testing, which requires human interpretation, much of which can and has been in error (http://www.indiana.edu/~ensiweb/lessons/unt.s.is.html). Yet, the obstinate public defenders of each side proceed haughtily forward as if absolute truth was on their side and indisputable facts bolstered their every proposition.